Although quite evidently born to be a star, Dave Kusworth has always been in the photograph, but rarely on the front page. This rakish Brummie was there when punk hit his hometown, and has played a significant role in the music scene of the Midlands and beyond ever since. 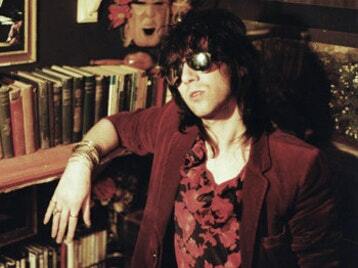 Hailed by the likes of Alan McGee, Bobby Gillespie and The Replacements’ Paul Westerberg as one of the great unsung British songwriters, his records have appeared on such renowned labels as Creation, Glass, Mammoth, Secretly Canadian and Bomp!, while his songs have been covered by groups and artists of the stature of The Lemonheads and Mercury Rev. A student at Moseley School of Art, Kusworth had been a member of seminal Birmingham garage-band TV Eye, whose should’ve-been-a-hit ‘Stevie’s Radio Station’ would, via a circuitous route, go on to form the basis of Duran Duran’s Top 10 globe-straddler ‘Rio’. Following a period in The Subterranean Hawks alongside TV Eye drummer Dave Twist and former Duran Duran singer Stephen Duffy, Kusworth wound up in London, joining the fledgling Dogs D’Amour in time to play on their debut album The State We’re In. Returning to Birmingham, he would hook up with his friend and former Swell Map, Nikki Sudden, in The Jacobites, releasing several acclaimed singles and albums during the 90s. Also that decade, Kusworth would form his own band The Bounty Hunters, signing to Creation Records for two albums, as well as solo releases. For the new millennium, he would return with another new band, The Tenderhooks, featuring his old friend Dave Twist. More recently, he has been both recording and gigging as The Dave Kusworth group. With a new solo album in the works, Kusworth has compiled the 20-track double-vinyl The World Of Dave Kusworth Vol 1 & 2 the first ever vinyl Kusworth career overview - drawing from his various releases over the decades, complete with eye-catching gatefold packaging by Twist in homage to Decca’s The World Of… series of compilations. Released on Troubadour via Easy Action, the album will also available as a single CD and download. Dave is available for interviews now.